Folneed :Each tablet contains Folic Acid BP 5 mg and Zinc Sulphate Monohydrate USP equivalent to elemental Zinc 20 mg.
Zinc is an essential trace mineral for normal growth and development during pregnancy, childhood, and adolescence. Zinc is a trace mineral which is required right from the time you conceive till delivery. It is very important for all phases of growth, tissue development & maintenance and immune system. Zinc is essential for many metabolic processes, protein and blood formation, wound healing. Zinc deficiency is characterized by growth retardation, loss of appetite and impaired immune function. Folic acid is the member of B-vitamin group. Folic acid is necessary for the synthesis of DNA, RNA and protein. It is especially important during periods of rapid cell division and growth such as infancy and pregnancy. Deficiency of Folic acid in pregnancy results in an increased risk of neural tube defects. Folic acid deficiency leads to megaloblastic anemia. Additional signs are weakness, sore tongue, headaches, heart palpitations, irritability and behavioral disorders. 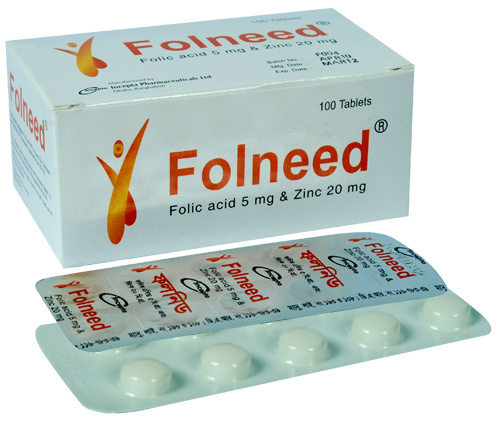 Folneed is indicated for the treatment and prophylaxis of Zinc and Folic Acid deficiencies. This tablet is well tolerated. Sometimes gastrointestinal disturbance like abdominal pain, dyspepsia, nausea, vomiting, fever and respiratory distress may occur.